You may have walked the fairways of Augusta, manoeuvred around the cliffs of Pebble Beach or witnessed the history of the Old Course at St. Andrews but rest assured that you have never seen a golf course as overwhelmingly striking as the Old Head of Kinsale. Eight of the holes play directly along the cliff tops, providing an exhilarating test of golf and concentration. 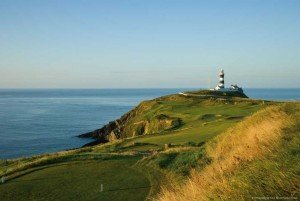 On a fine day, the Old Head can actually accommodate a fairly low return but the vagaries of the Atlantic winds ensure that the course offers a different challenge every day.